The page (computer:cpu:microprocessor) doesn't exist. You have been redirected automatically to the best page. A CPU is just a device name that indicate a device that controls a computer system. The fundamental operation of most CPUs, regardless of the physical form they take, is to execute a sequence of stored instructions called a machine code program. All instructions are defined in a document called an Instruction Set Architecture (ISA). Every processor that implement this ISA, need to implement each instruction described in it. The execution of each instruction goes through four main steps (stages) that all CPUs use in their process pipeline called the instruction cycle. A (CPU|Processor) has several (execution|processor) cores. and the translation lookaside buffer (TLB). The arithmetic-logic unit (ALU) holds the wiring for doing arithmetic on the numbers held in the data registers. The control unit holds wiring that triggers the arithmetic operations in the ALU. How does the control unit know to request an addition or a subtraction? The answer is: it obtains instructions, one at a time, that have been stored in primary storage. The instruction counter is a register that tells the control unit where to find the instruction that it must do. 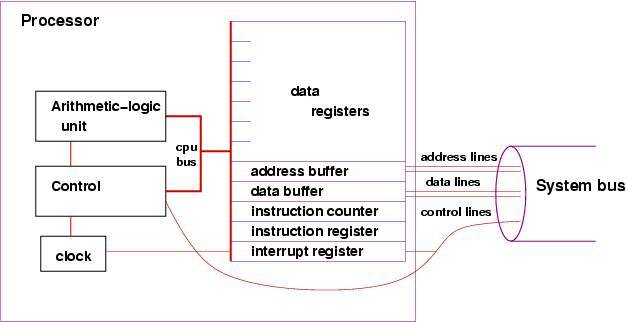 The address buffer and data buffer are two registers that are a “drop-off” point when the processor wishes to copy information from a register to primary storage (or read information from primary storage to a register). Virtual Memory - Memory Management Unit (MMU) ? The maximum Throughput is the amount of data that the CPU is able to process without any latency by interfering processes. and S equals bus speed in MHz. The equation above might be accurate to a certain extent but in reality the number might drop a bit caused by overhead. Because of these problems, various standardized tests such as SPECint have been developed to attempt to measure the real effective performance in commonly used applications. What usually has the greatest negative effect on processor performance? What usually has the greatest positive effect on IO ? Documentation provided from CPU manufacturer. For example, Intel® 64 and IA-32 Architectures Software Developer Manuals.